Roof Restoration can be a great intermediate option for building owners that need to make the current roof last longer because a full replacement or recovery system is not in the budget for the near future. These systems can be used over many membrane types including conventional “built-up”, smooth/granular surfaced modified bitumen, EPDM rubber, sprayed polyurethane foam, thermoplastic single-ply membranes, and most metal roofs. A restoration system is typically a fully adhered coating with an expected service life of up to 10 years. Some of these materials can applied as "renewable systems" be depending on the specification selected and the type of substrate. It is important to note that there are several different variations of coatings that can be applied to an existing flat roof designed to accomplish specific goals. Aluminum and acrylic coatings for instance are designed to provide greater reflectivity, lowering the temperature of the roofing layer and therefore slowing its ageing process. These reflective coatings, can improve the building’s energy efficiency and lessen surface temperature, but do not add any additional waterproofing. On the other hand, there are SEBS elastomeric systems that will produce a cool, white roof while at the same time adding reinforced waterproofing to the existing roofing system. You can read more about the dynamics of acrylic and elastomeric / thermoplastic / neoprene coatings on our liquid coatings page. Is Roof Restoration an option for my building? 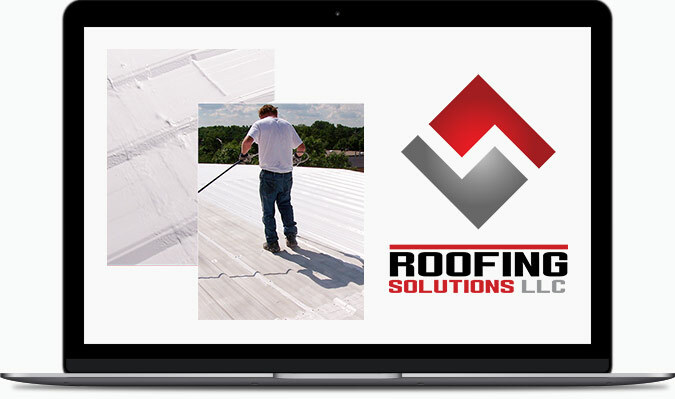 While there are many “coating” contractors that promote these systems to everyone and make claims that they will work with virtually any roofing system in place, the best answer is that roof restoration may be an option for you, depending on several factors. It is true that you can spray apply a coat or two of waterproofing on any existing flat roof, no matter what the membrane looks like. However, much like a successful traditional recovery system, the existing roof must present a viable substrate for the application of a restoration system, or monies spent on simply spraying the roof will be wasted. 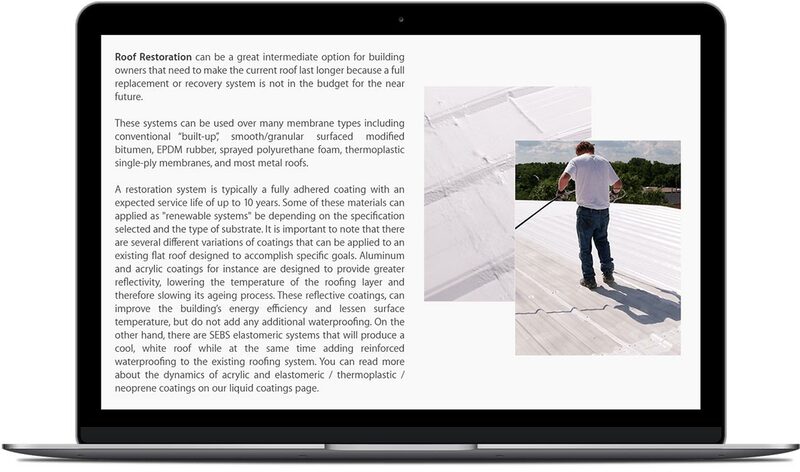 The concept is the same as installing a third roof or installing a second roof over a roof that is currently holding water either between the membrane layers or in the insulation.These systems can only be effective if they are used over a roofing system that does not contain moisture and has a surface capable of accepting a uniform, smooth coat. For example, some built-up roofs with embedded gravel in the flood coat may not be good candidates for these systems because that surface would not allow for a uniform coat to be applied. The best way to find out if this is an option is to have an expert from Roofing Solutions come out to your building and examine the roof. This process comes without a price tag nor an obligation. Making this simple phone call could potentially save you tens of thousands if the system is a match for you.